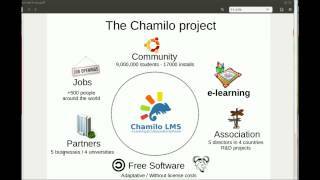 Chamilo LMS, or Chamilo Learning Management System is a piece of software that allows you to create a virtual campus for the provision of online or semi-online training. It is distributed under the GNU/GPLv3+ license and its development process is public. All the Chamilo software products are entirely free (as in freedom), free (as in beer) and complete, and are production-ready without requiring any type of payment. If you need professional services or assistance to get your project further, we recommend you check our official providers list.